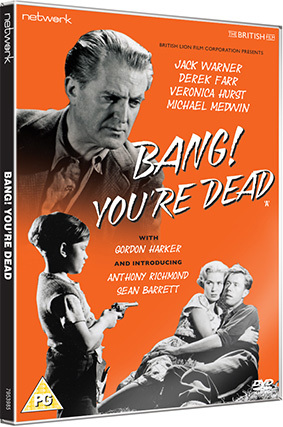 The tension is unrelenting in the powerful 1954 crime drama, Bang! You're Dead starring Michael Medwin as an innocent man standing trial for murder under the weight of apparently damning evidence. A terrible accident occurs when two small boys are playing ‘highwayman’ in a wood and a cyclist is killed. His body and the weapon are found by Bob Carter who had recently quarrelled with the victim in the presence of their workmates. The evidence of foul play is strong, and Bob is arrested for murder. Director Lance Comfort (Hotel Reserve) is one of British cinema’s most prolific and versatile, yet critically neglected figures. His body of work – typically tightly scheduled B-movies – has undergone re-appraisal only relatively recently. Presented here in a brand-new transfer from original film elements, Bang! You're Dead (later retitled Game of Danger) showcases both his innovative style and compellingly dark vision. Bang! Your Dead will be released on UK DVD on24th February 2014 by Network as part of 'The British Film' collection at the RRP of £9.99.